Welcome to this month’s Magical Blogorail Red loop. Today we are discussing fun things to do on your summer vacation outside of the Disney Parks. It’s true, we’ve been a lot. But I guarantee you, I could move to Florida tomorrow and live there for my remaining 75 years (I’m 31 right now. That phrase contained so many points of optimism…) and never see all that Walt Disney World has to offer. I had a friend ask recently what I would do if I found myself by Walt Disney World without a ticket into the parks. The good news? There’s no shortage of options – many of them free. 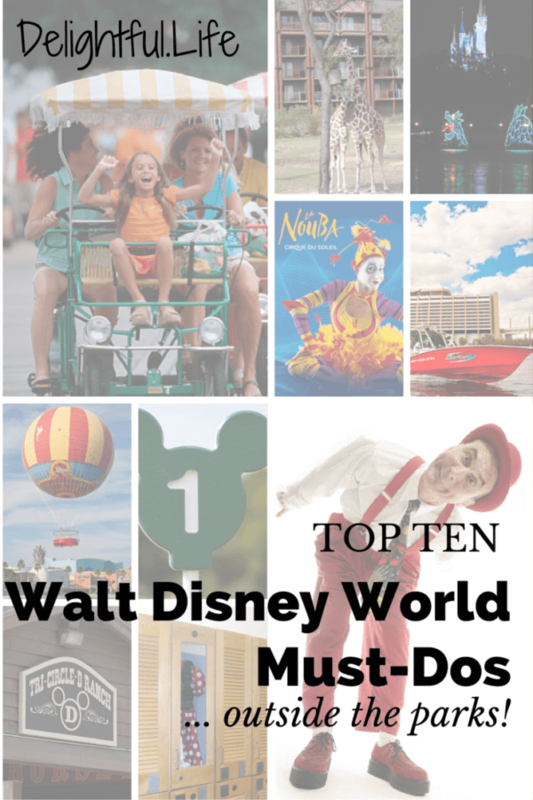 In fact, I could write a whole book on such things… but until then, here are ten ideas if you find yourself in the Walt Disney World area with no ticket media, discover a few extra hours during your vacation, or you just need a change of scenery during long summer days at the parks. Or if, you know, you need some ammunition when someone asks you why you’re headed back to the most magical place on earth, again. 1. Rent a surrey bike and take a ride along Disney’s Boardwalk. The Boardwalk is found just outside of Epcot’s International Gateway in the Epcot Resort area. 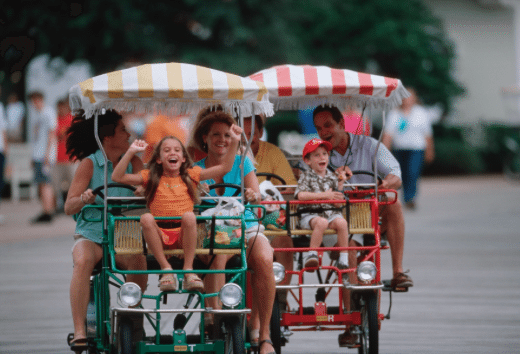 Accessible by car, bus, or boat, or within walking distance from Epcot and Disney’s Hollywood Studios, the Boardwalk has lots of entertainment, dining and shopping options – and the charming surrey bike is the best way to see it all! If you’re riding or strolling along the boardwalk at night, you may even see sword-swallowers, jugglers, live music or numerous other entertaining acts! 2. 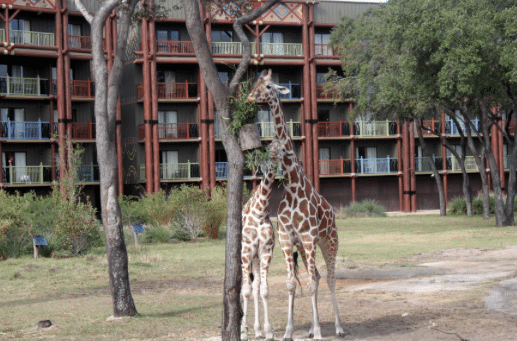 Visit the animals on the savannas at Animal Kingdom Lodge. The Walt Disney World resorts are open to the public to visit, and one of our very favorites is the Animal Kingdom Lodge. The lodge has two distinct sections, each with their own savannas – four in total. Each savanna has a variety of animals, so no matter where you find yourself you’re sure to see something exciting! Keep your eyes open for zebras, ostrich, giraffes, warthogs, Ankole cattle, and so much more. Depending on the time, you may also see the animals getting fed or use night-vision glasses to view them after dark. Each evening, you can also catch African storytellers around a fire pit – the perfect way to end a visit! 3. Catch a Yehaa Bob show at Port Orleans Riverside. “Yehaa” Bob Jackson has been captivating audiences with his piano sing-a-long for years. He has worked in Disney parks even longer (at Casey’s Corner and Tarzan Rocks) before finding his groove – and a huge following – in this super fun show. 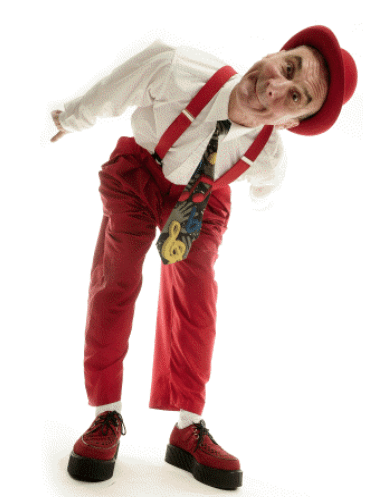 You can find him most nights from 8:30pm-midnight entertaining guests in three free, family-friendly sets. 4. Hit a few golf balls. If you’re like me, you’ll thoroughly enjoy the two impeccably-themed miniature golf courses, Fantasia Gardens and Winter Summerland. Fantasia Gardens, as you might expect, is a pair of Fantasia-themed courses just behind the Epcot resorts. With one course more suited for families and beginning golfers and another that may challenge even the most serious of golfers, there is something for everyone – and good shots may even be rewarded with a little musical number. Winter Summerland is located near the Blizzard Beach waterpark and is “Santa’s Off-Season Retreat”. One course is snow-covered like the nearby waterpark, the other is a tropical Christmas theme – both are a lot of fun for families with kids of all ages. 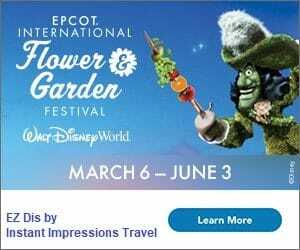 The prices are very reasonable, and discounts are often given for Disney Vacation Club members and Annual Passholders. 5. Get a bird’s eye view of the resort on the Characters in Flight balloon. 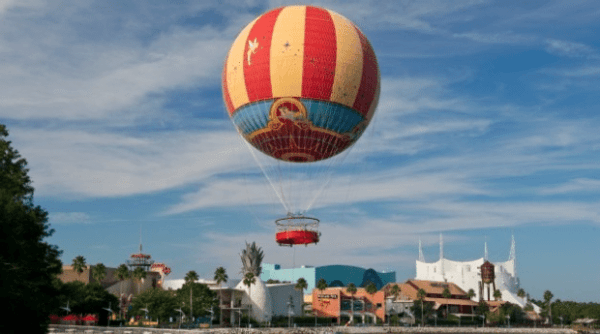 Located in Downtown Disney (and visible in many locations throughout the Walt Disney World Resort), the balloon takes you 400 feet in the air to provide a 360-degree view of up to 10 miles. Tip: Look for discounted prices before 10am. 6. Indulge in a facial, pedicure, massage or other spa experience. Sure, sure. Walt Disney World is just for the kids. But in case you don’t believe that, you should check out one of two Senses Spa locations (Grand Floridian and Saratoga Springs) or the Mandara (Walt Disney World Dolphin). There are also spa services located at several of the other deluxe resorts throughout the property. The experiences I have had any time I have set foot in a Disney spa – whether in Florida or on a Disney Cruise ship – have all been outstanding. 7. Ride a pony! 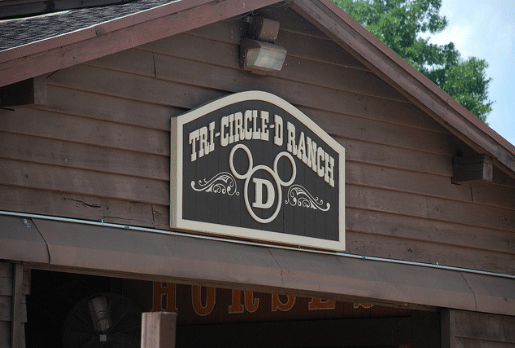 Tri-Circle-D Ranch at Disney’s Fort Wilderness Resort and Campground has so many things to do that you could spend days there without setting foot in a park, and I could spend hours talking about it. Children 2 years and older (and up to 80 pounds) can ride a miniature pony in what seems like the most secluded place in all of Central Florida – despite it being just a boat ride away from the Magic Kingdom. Once they’ve ridden, say hello to the Magic Kingdom horses and see a working blacksmith! Or if you’re all over the 80 pound mark, consider riding a Segway or horse on one of the many trails throughout the grounds. 8. 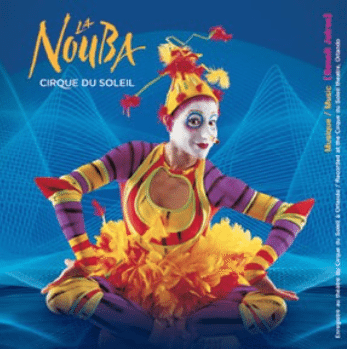 See the award-winning Cirque du Soleil show, La Nouba. It’s not every city that has a Cirque “show in residence”, but if you’re at Walt Disney World you are just steps away from one! Despite opening in 1998, the show is still incredibly popular and it is not unusual for it to sell out. It’s definitely something you should see at least once, but you may want to secure your tickets in advance! 9. 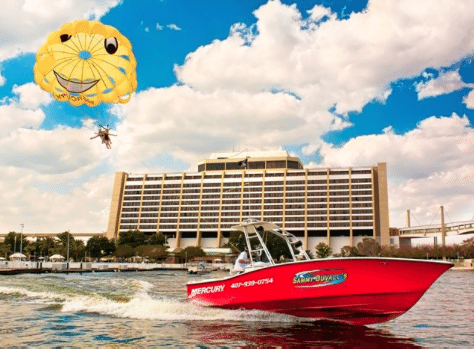 Rent one of a variety of watercraft and make waves on the Seven Seas Lagoon or Bay Lake. Sammy Duvall’s Watersports Centre at the Contemporary Resort Marina is just one of the places you can rent watercraft for a fun, relaxing kind of afternoon you may not expect while on a Disney vacation. Go parasailing. Try your hand (foot? Entire body?) at waterskiing and/or wake boarding. Rent wave runners or tubes, or go on fishing excursions. It’s a really unique way to see many of the sites around the lagoon, in addition to having tons of fun on the water! 10. End your evening with the Electrical Water Pageant. Every night (weather-permitting) since the year Walt Disney World opened (1971), the Electrical Water Pageant has been running its course throughout the Seven Seas Lagoon. It is Walt Disney World’s longest running nighttime event of any sort, by decades! The parade consists of 14 barges each with a 25-foot tall light display, themed from King Triton and “Under the Sea” to Peter Pan and a patriotic finale. 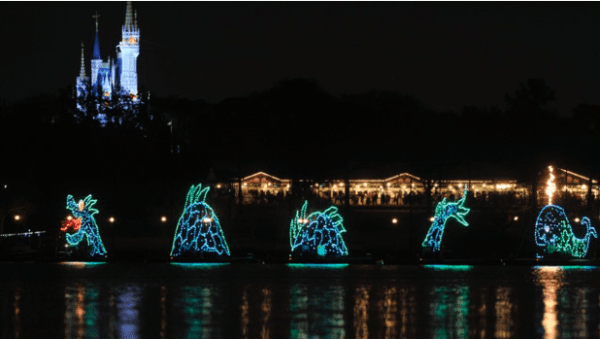 You can plan to view the pageant from any of the following locations as it makes its way around the lagoon (in this order), beginning at approximately 9pm each night: Polynesian Resort, Grand Floridian, Wilderness Lodge, Fort Wilderness, Contemporary Resort, and the Magic Kingdom (on select nights). It’s always fun to watch people when they catch the Electrical Water Pageant by surprise, but it will be even more special for you to watch it knowing its long-standing history! What is YOUR favorite non-park thing to do on a Disney vacation? I think I’d have a terrible time deciding how to spend my “off-days” at WDW with all those fun activities 🙂 Thanks for sharing! 🙂 Well, for the sake of full transparency, we actually can’t get out of the parks enough for more than an off day or two half days on a given trip. We always say that one time we’ll go and not even buy admission! That is a great list you’ve got. Even though I have never stayed at the Animal Kingdom Lodge, it is by far our favorite thing to do outside of the parks. My son loves going there and being able to take our time with viewing the animals. I love that you go even when you’re not staying there! Visiting the various resorts is one of our favorite things to do, and I think a lot of people don’t know it’s an option! Lots of fun activities to choose from! I’ve always wanted to visit Circle D ranch and see the campground. I love love love Yeehaw Bob!! Heard a rumor he may move to the Springs. Not sure how I feel about that. It was so fun to see him in that intimate setting. I have heard the same. I would imagine – or at least hope – he would maybe do shows in both locations? Who knows though, if he shows up at the Springs and more people catch him, they may never have room for the crowds in POR again! What a great list! I really want to see Yeeha Bob someday. Thanks, Cindy! I saw him for the first time with a group of friends last fall, and we fell in love with the show instantly! A friend discovered the joys of trying all the types of transportation between the resorts and exploring the resorts. We spent almost a whole day doing that and met some delightful people in the process.